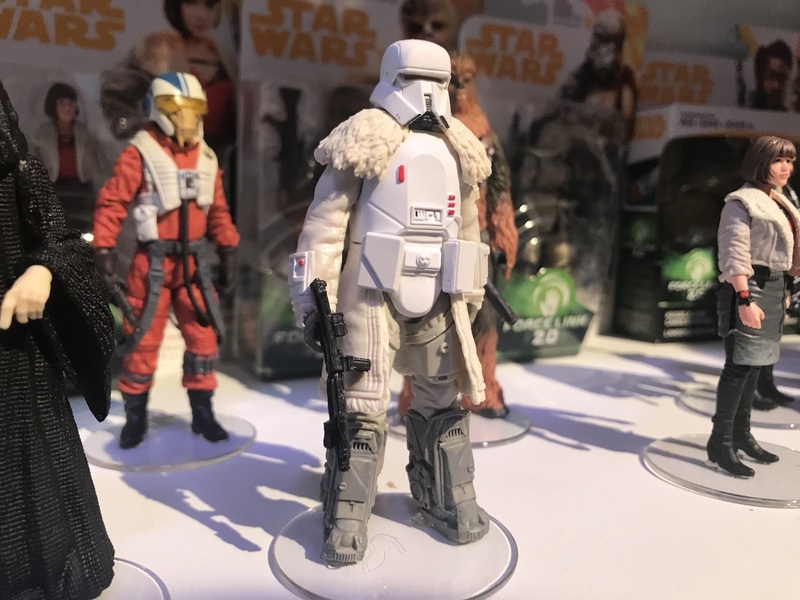 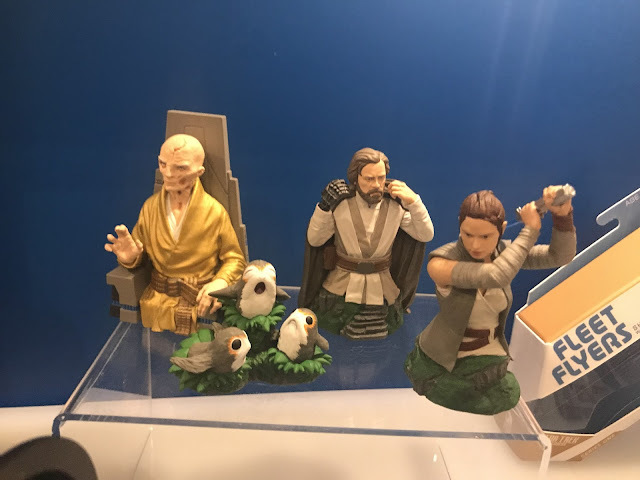 Our regular Toy Fair correspondent Yehuda Kleinman returns for a report on this year's offerings in New York. 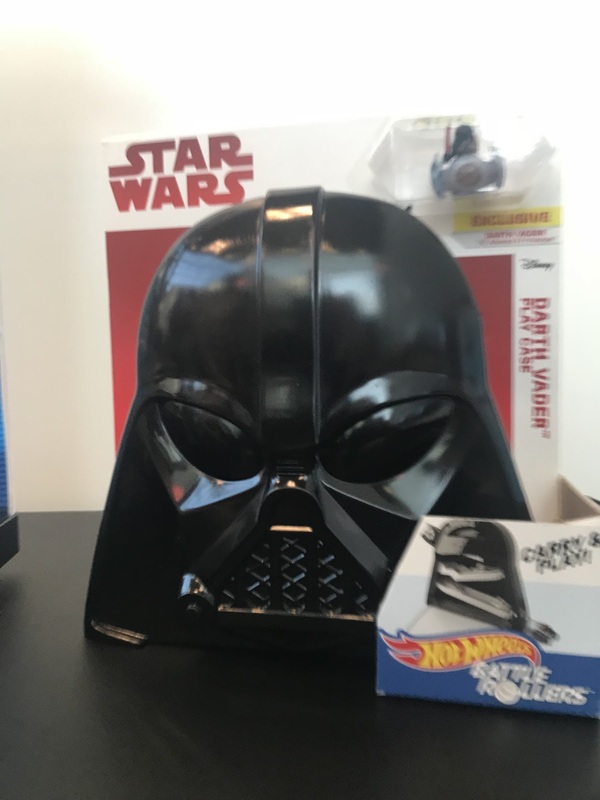 For over a century, Toy Fair has been an annual weekend event that takes place in New York City. 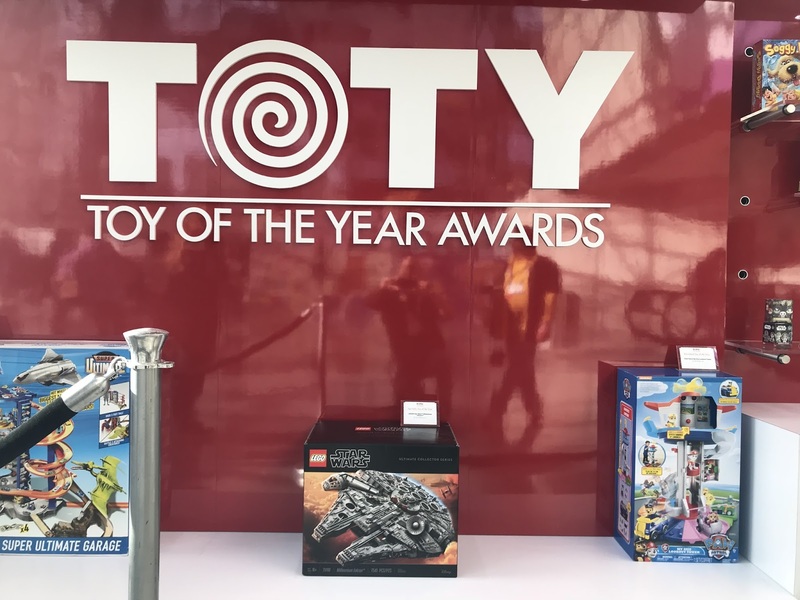 Open to press and industry personnel only, the event is used by toy manufacturers from around the world to introduce their upcoming projects for the following year. Kenner first debuted their lines of Star Wars toys to the world at Toy Fair in the late 1970s and early 1980s, with iconic releases including the introductory Early Bird Package and the infamous and unproduced rocket firing Boba Fett. 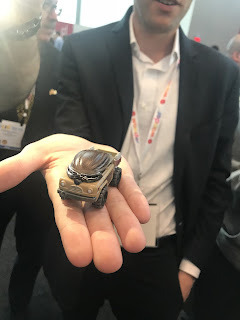 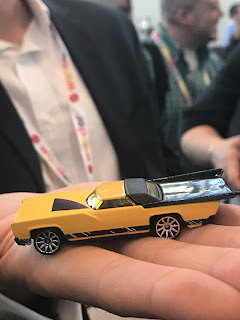 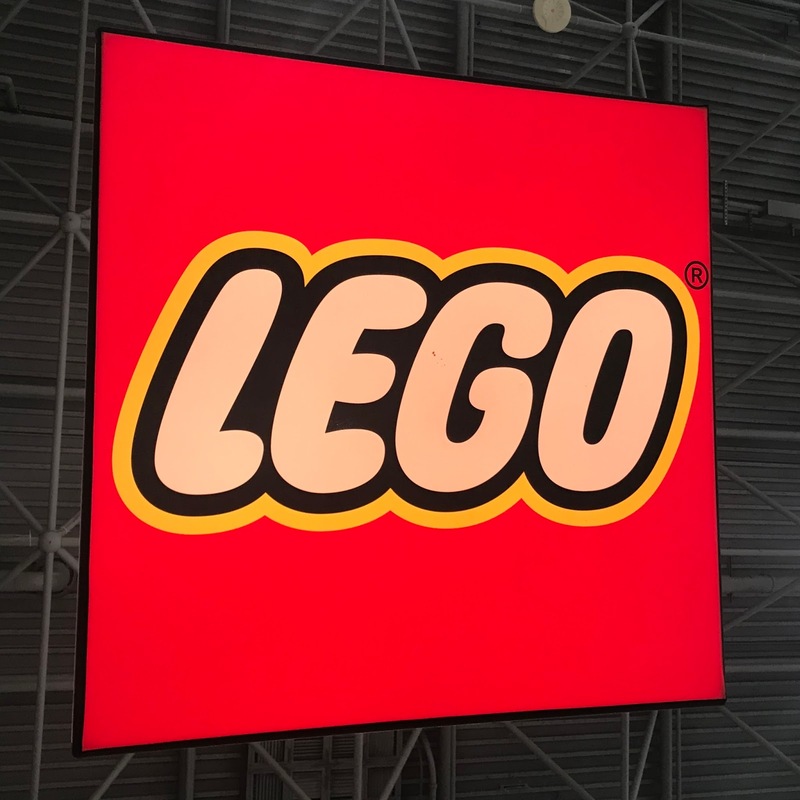 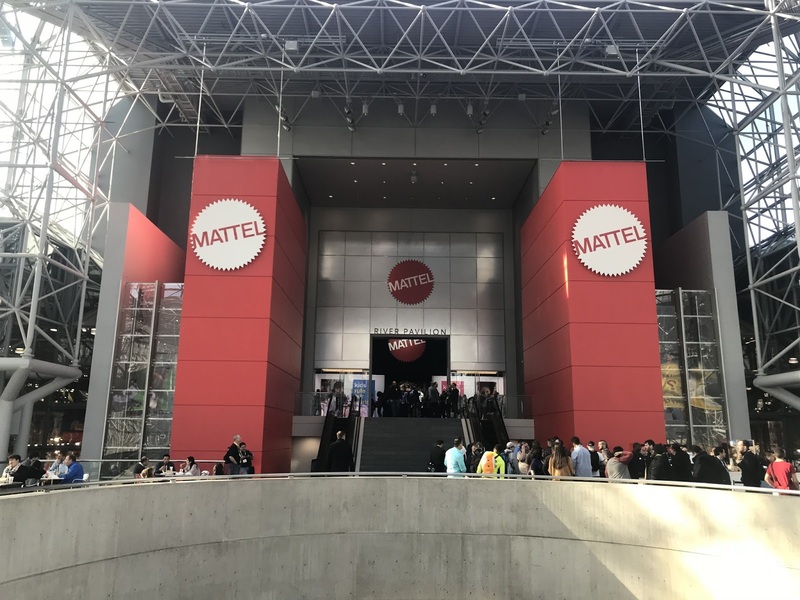 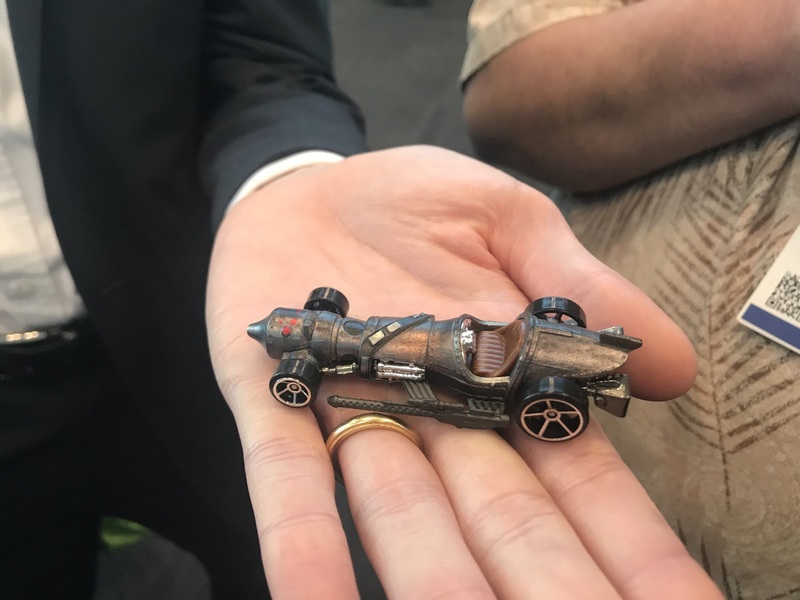 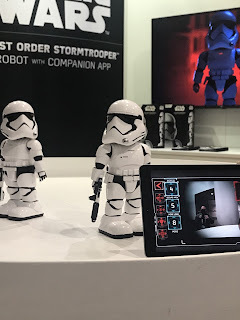 Having covered Toy Fair for the past several years, I often wondered what it might have been like to have previewed a toy that would be an industry changer. 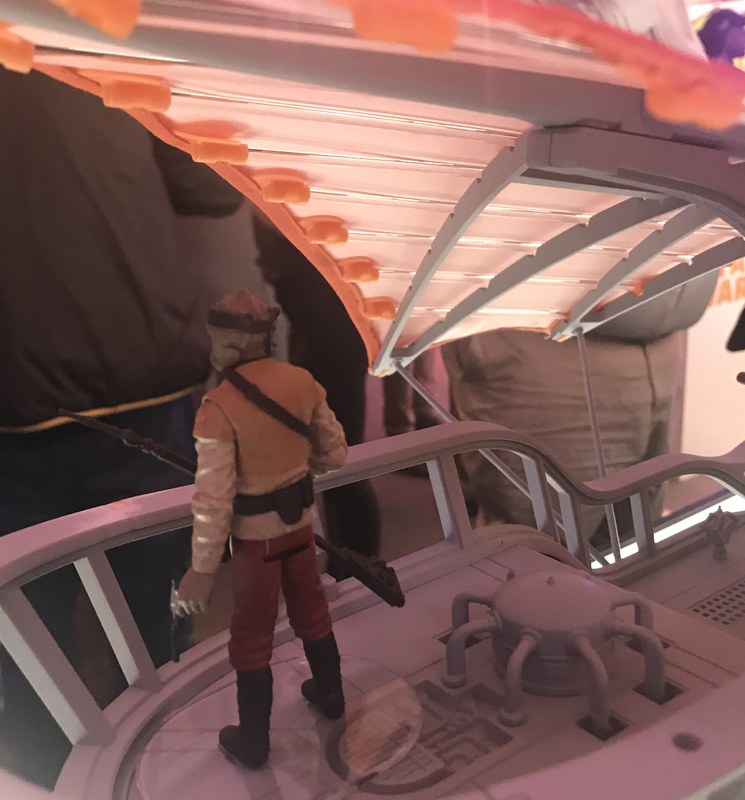 This year, Hasbro accomplished that with their Jabba's Sail Barge produced for the 3.75 inch action figures line. 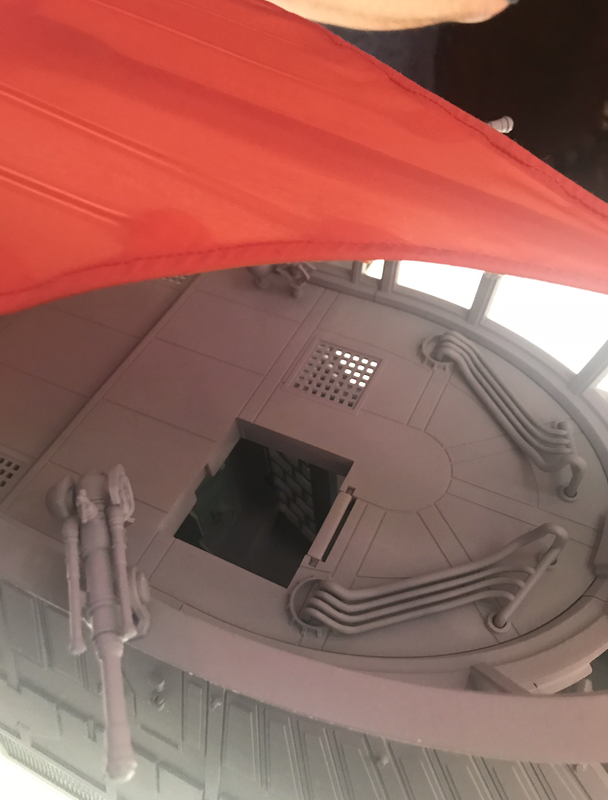 The nearly five foot toy is brilliantly crafted and includes details from the movie, including a shackled Hammerhead prisoner skeleton and a stuffed and mounted baby Rancor in Jabba’s throne room. There are also functioning portal shutters for battle scenes. I was fortunate to meet up with Mark Boudreaux, Hasbro’s senior principal designer and creator of the Sail Barge. 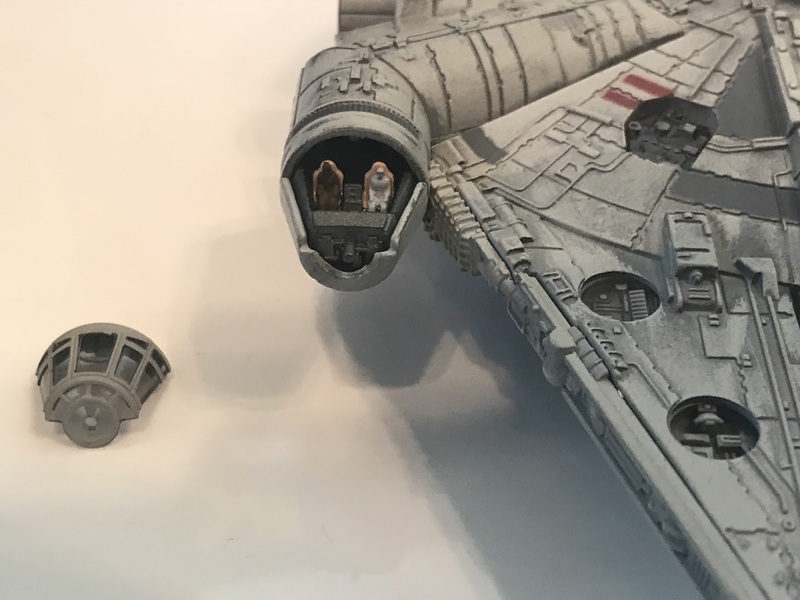 Mark has been with Kenner and then Hasbro for over 40 years and is responsible for creating every Millennium Falcon toy ship produced by the company. 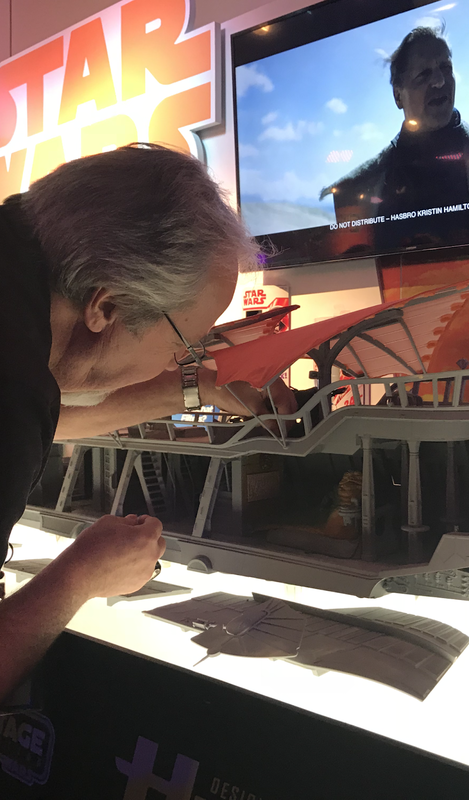 Mark and his team worked closely with Lucasfilm to produce a scaled screen accurate model with endless playability. There are multiple removable panels to access the interior of the Barge, which was designed with internal connecting passageways so figures can move through different sections of the toy without leaving the play environment. 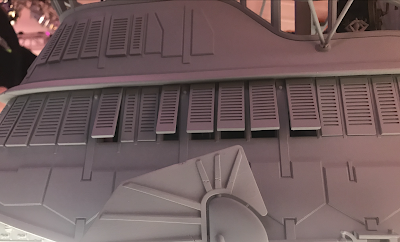 The ship boasts 2 cloth sails which include the intricate supports seen in the film. Changes Mark developed included a Lucasfilm approved cockpit for the ship (since it was never designed for the film) and an upper deck with open gratings to allow overhead lighting to penetrate to the lower deck. 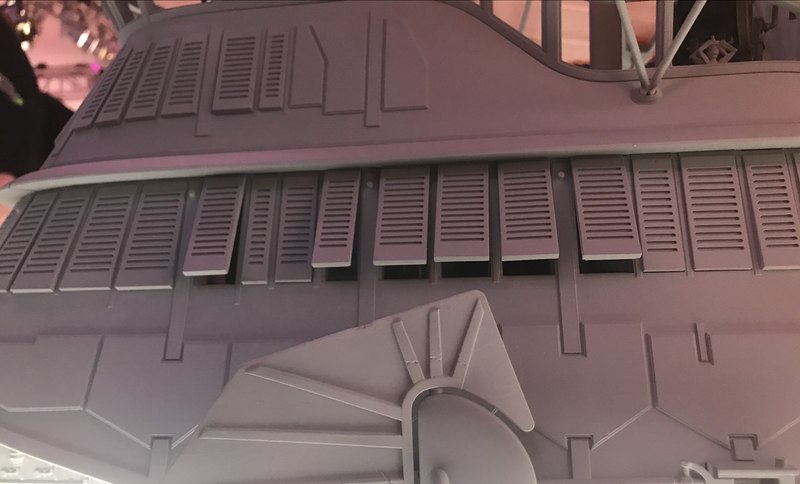 The ship will be packaged with vintage styling. It’s not only the size and scale of this the Sail Barge that makes it a industry changer, it is also the way that Hasbro has planned on financing the project. 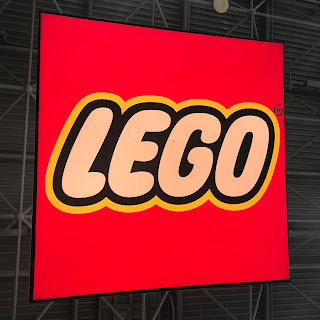 Despite the demand, until this point large-scale projects of this kind where far too financially risky to produce. 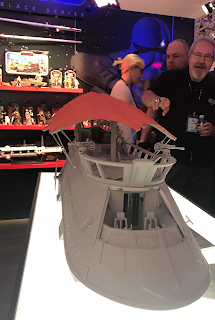 To combat this concern, Hasbro has created a platform called HasLab to crowd fund the Sail Barge. 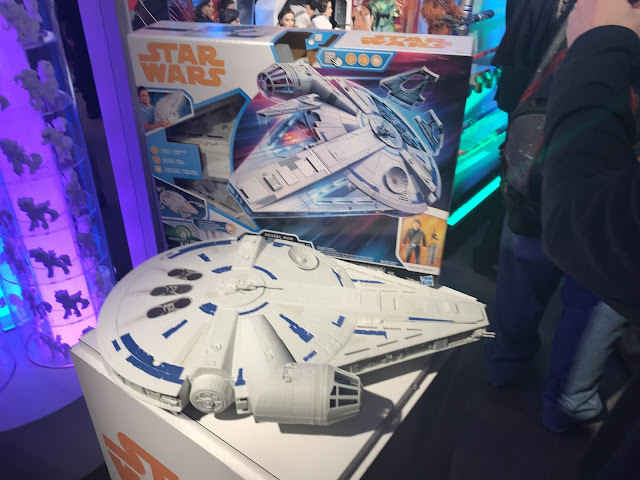 The monumental toy is priced at $500 including shipping to United States direct from Hasbro. 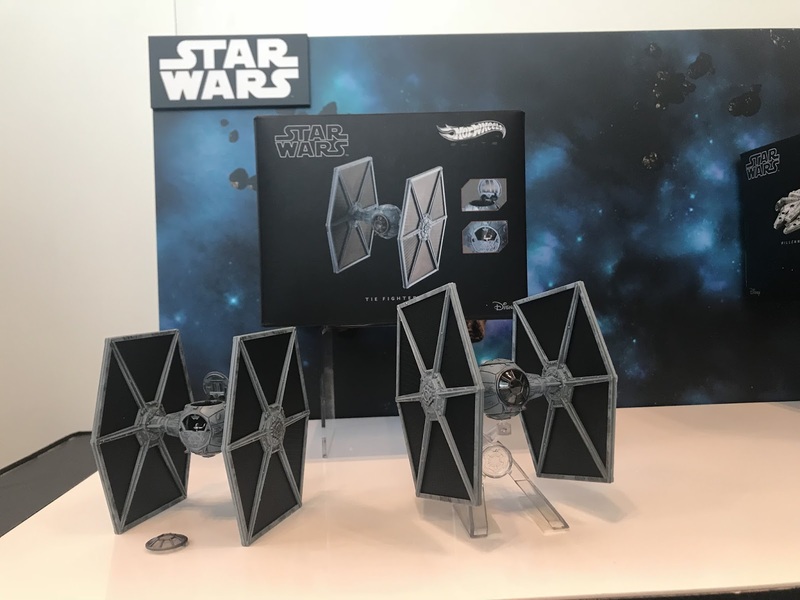 However, the toy will not be produced unless 5,000 people pre-order it before April 3rd, 2018. 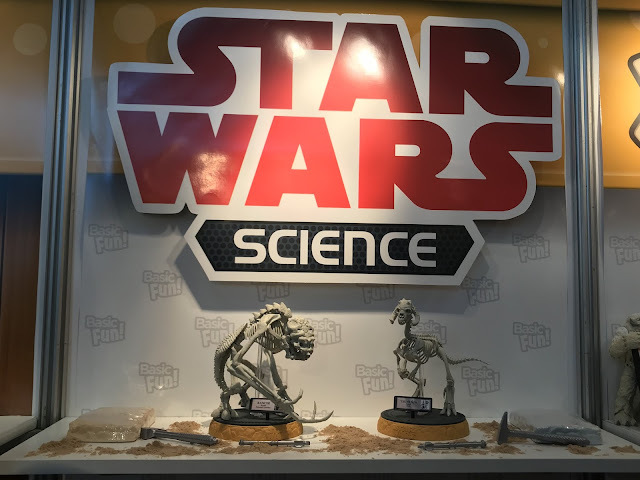 If this project is successful, Hasbro plans on releasing other fantasy projects also crowd funded through the HasLab platform. 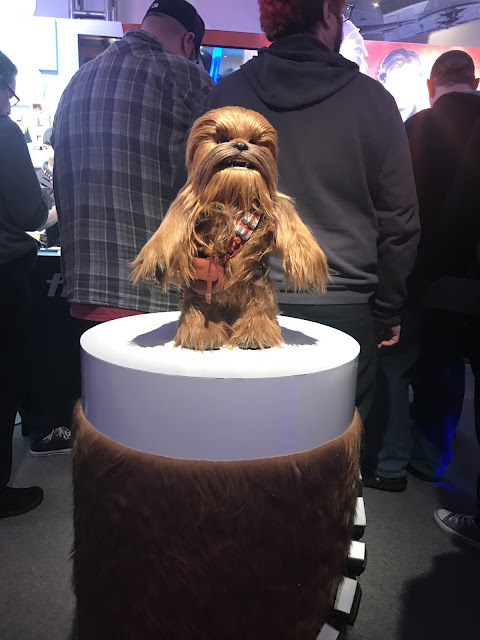 Also from Hasbro this year is an adorable interactive plush Chewbacca with accelerometers that allow the toy to react to motion and touch. As has been tradition, Lucasfilm has limited the amount of information available for the latest project, which this year is the stand-alone movie Solo. The film is scheduled for release on May 25th and Lucasfilm is holding back most information about the movie until mid April. 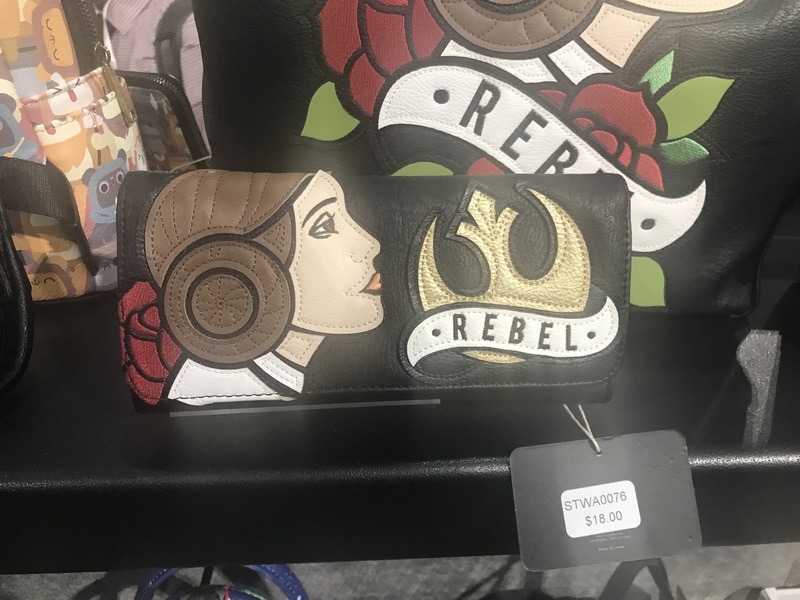 There were a few notable exceptions displayed. 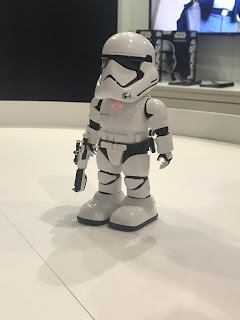 On display was a prototype of a 3.75" inch scaled pristine and (pre? 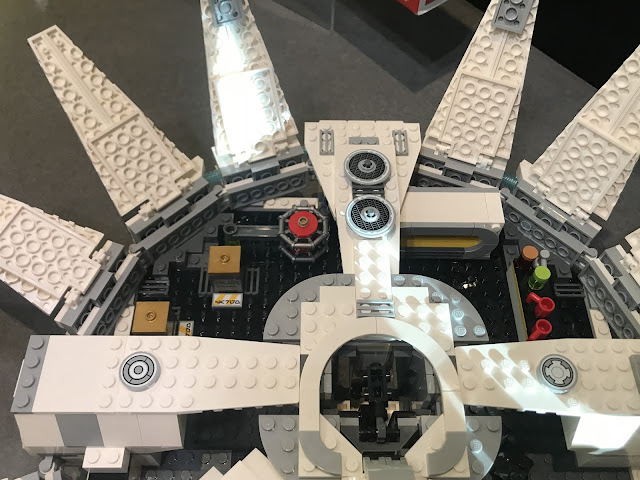 )modified version of the Millennium Falcon (to be piloted by a much younger Han Solo). 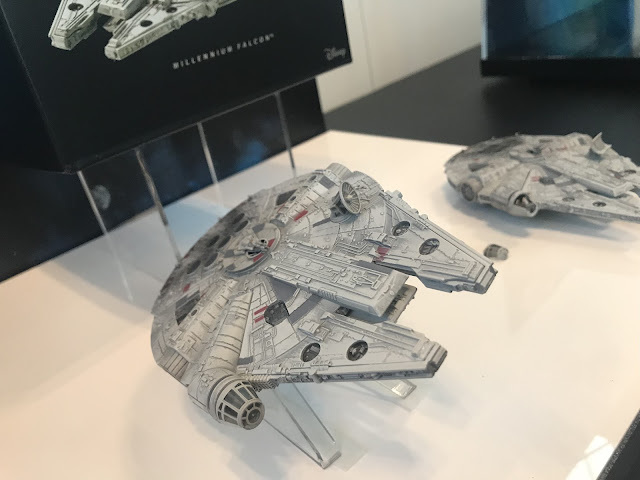 The ship has blue striped details and cleaner lines than the more familiar "higher mileage" version. 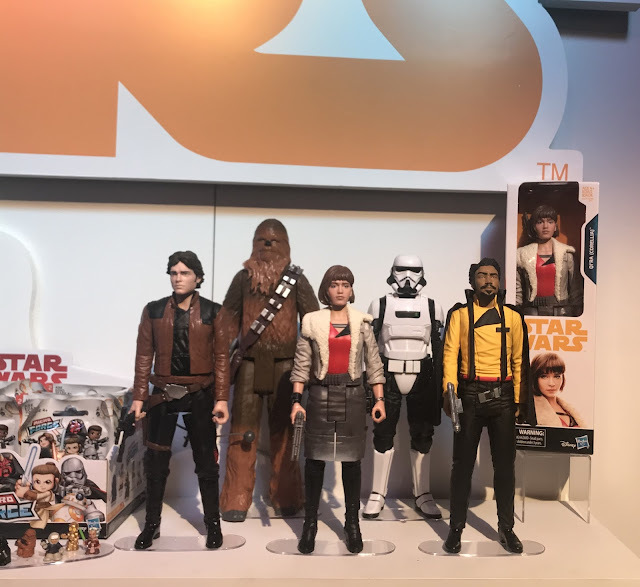 Also shown were new incarnations of familiar characters as well as some new additions for the upcoming film, including a nice line of large size action figures. 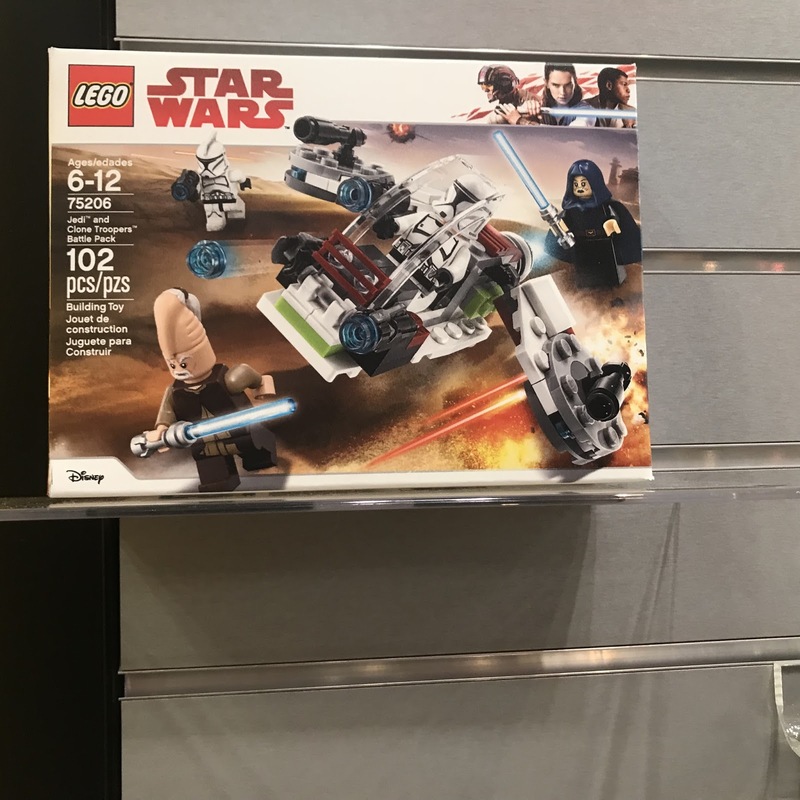 Lego announced three new Star Wars sets for the first half of this year. 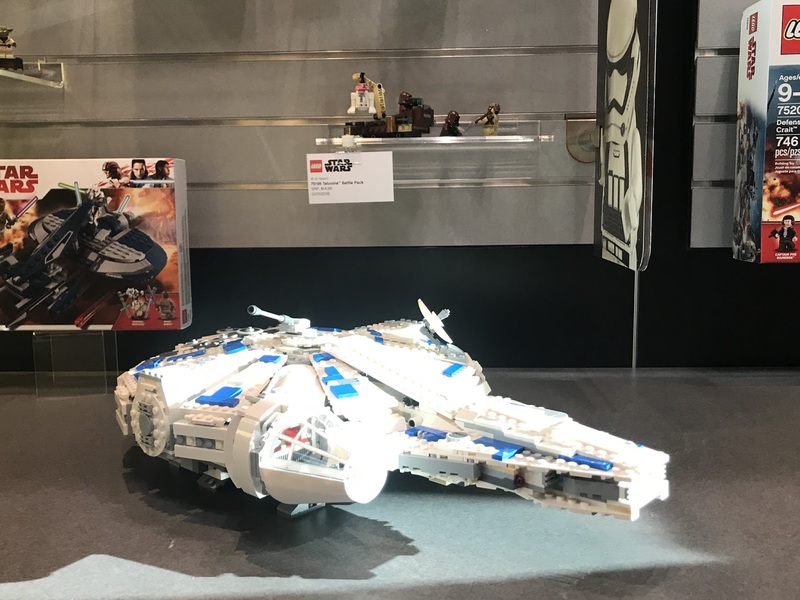 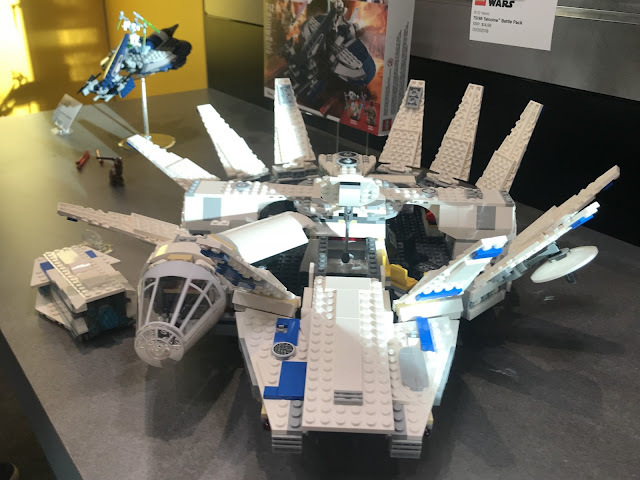 For the film Solo, Lego offered their version of a hot-rodded Millennium Falcon featuring a retractable roof which reveals a less than familiar interior, including what appears to be a lounge with a bar. 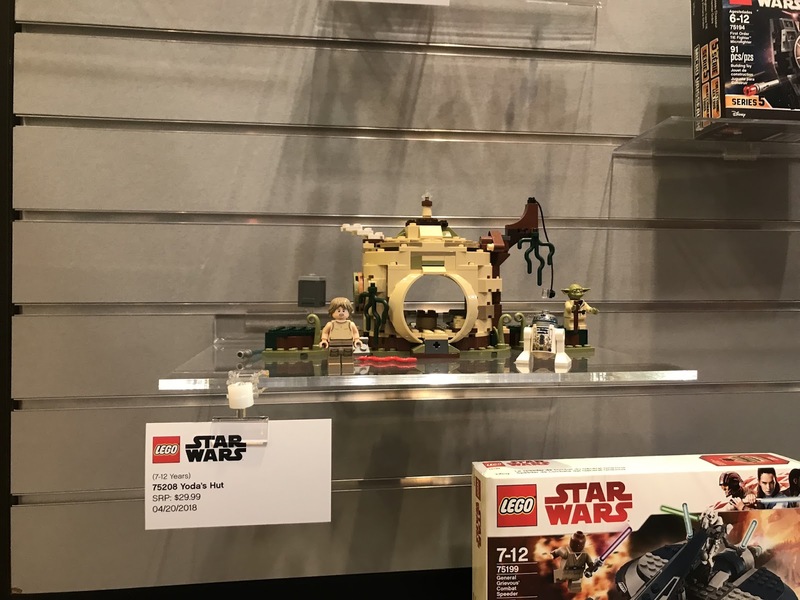 Lego also released an updated Yoda’s Hut playset as an Original Trilogy offering and covered their bases with a Clone Trooper set to represent the Prequels. 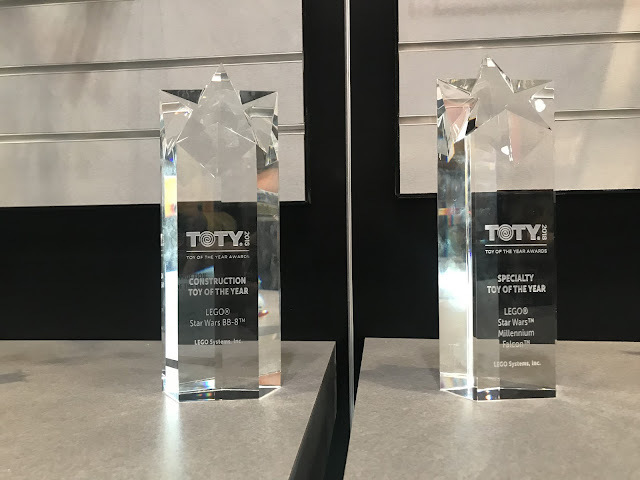 Lego preformed extremely well with the Star Wars line winning two Toy of the Year (TOTY) awards last year. The first was for their Ultimate Millennium Falcon (the largest Lego set ever produced) and the second award was for their large size BB-8 model. 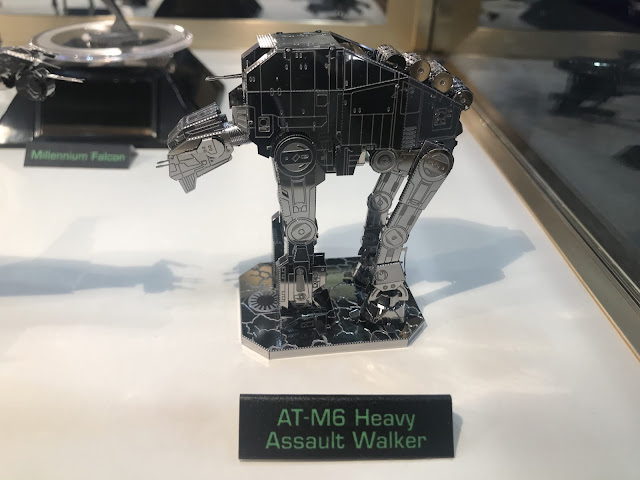 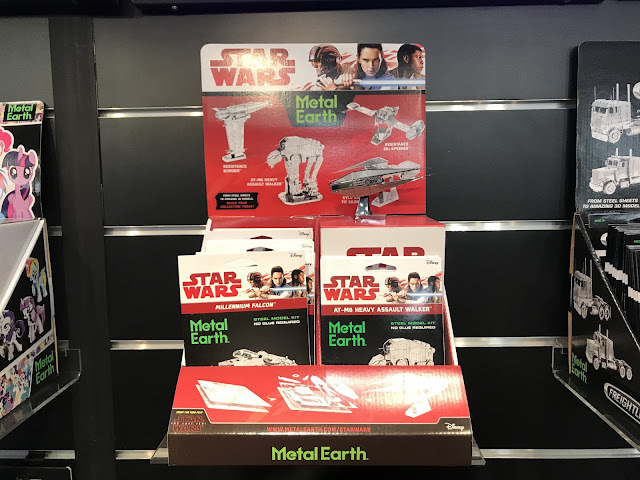 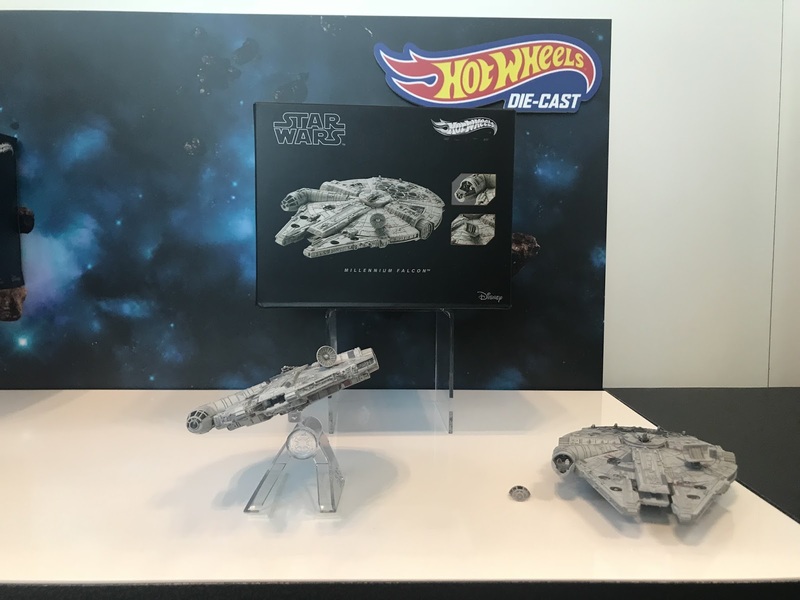 Mattel presented two beautiful diecast models in their “Elite” series which included a meticulously sculpted miniature TIE Fighter as well as a very detailed Millennium Falcon. The company also introduced a new line of small diecast vehicles with oversized characters called "Battle Rollers." 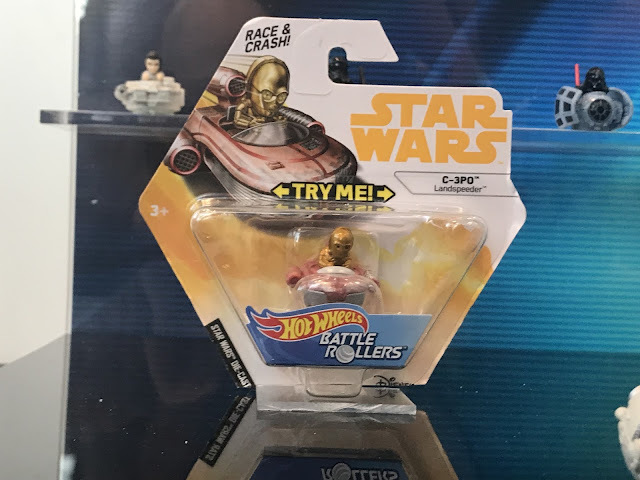 The line spans every Star Wars movie era and the toys are meant to be collected, raced, and crashed. The line even comes complete with a Darth Vader Collectors Case. 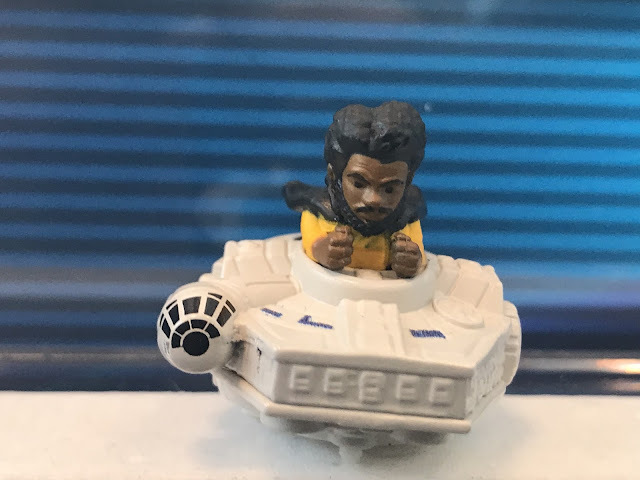 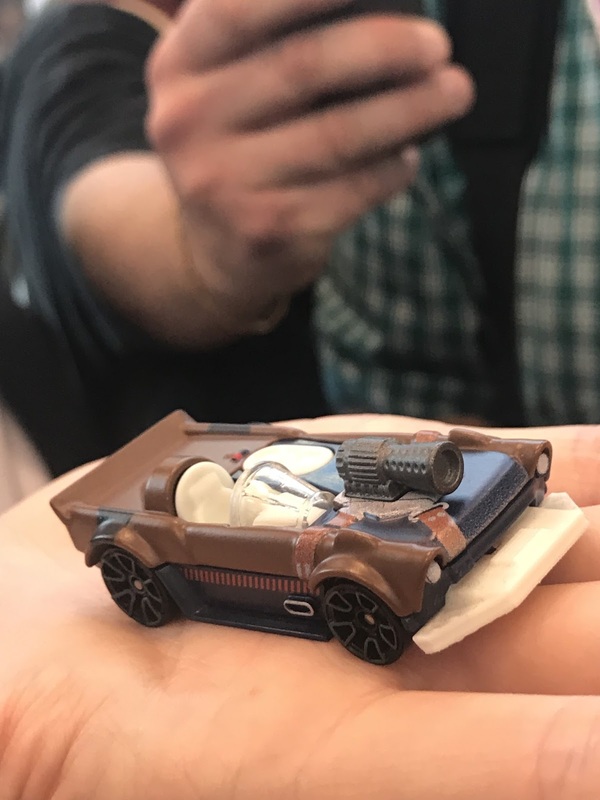 Continuing their popular line of Star Wars character cars, Mattel debuted four more cars including Chewbacca, IG-88, Han Solo, and Lando. 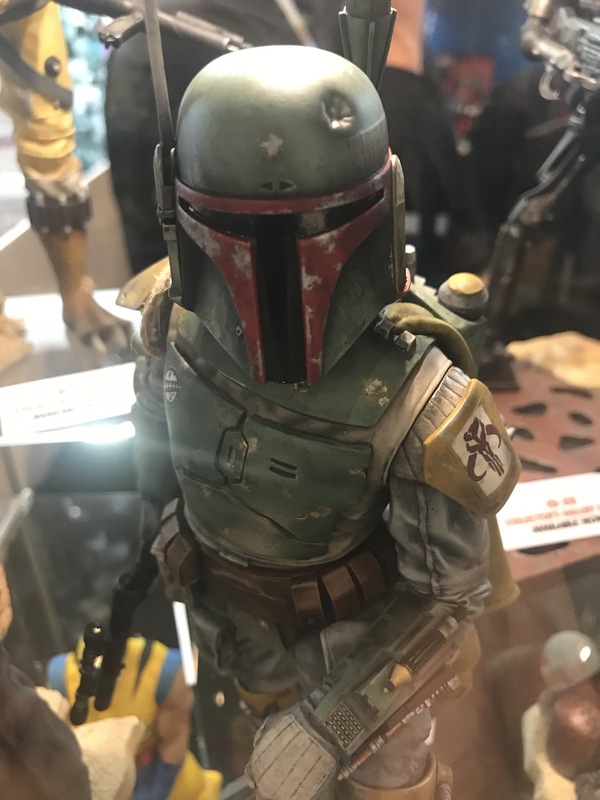 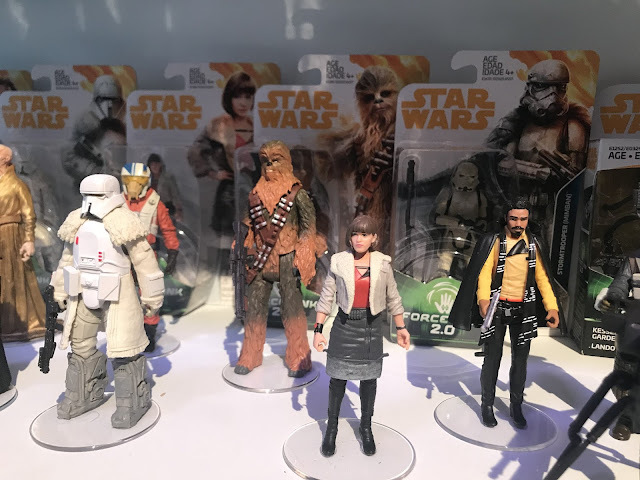 Extending their usual product lines, Gentle Giant presented new premium Boba Fett and 4-LOM figures along with a series of new maquettes for The Last Jedi. 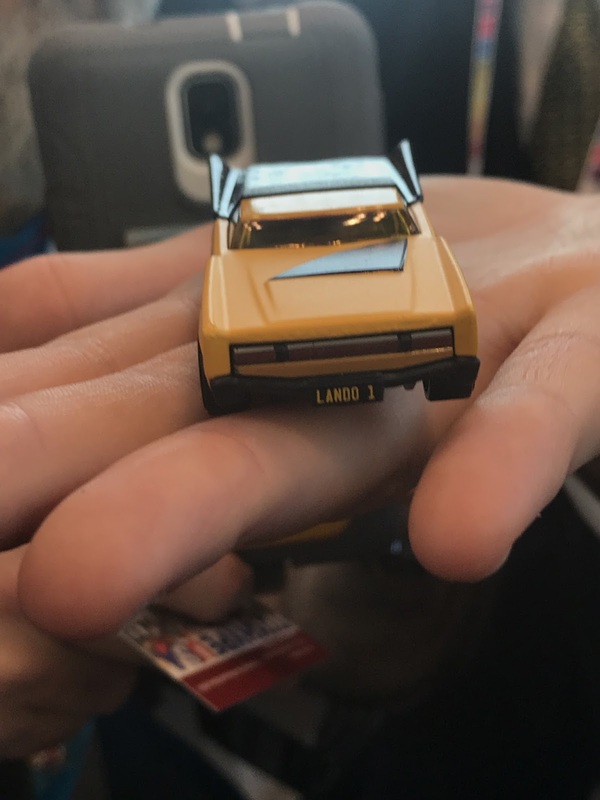 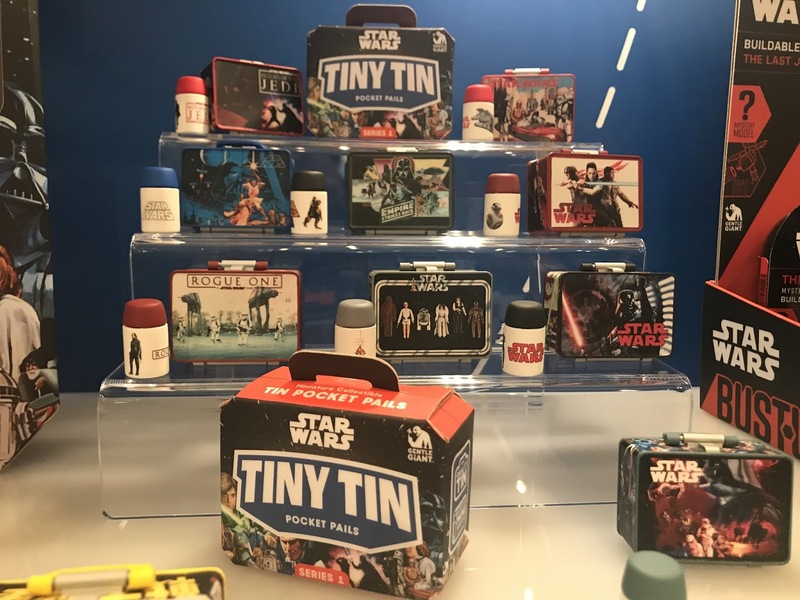 They also showcased a new line of collectible miniature lunchboxes which are miniaturized reproductions of classic vintage lunchboxes as well as unique different designs. In Gentle Giant style, they are incredibly detailed and include an accurate mini thermos and instructions printed on the inside of the lunchbox. 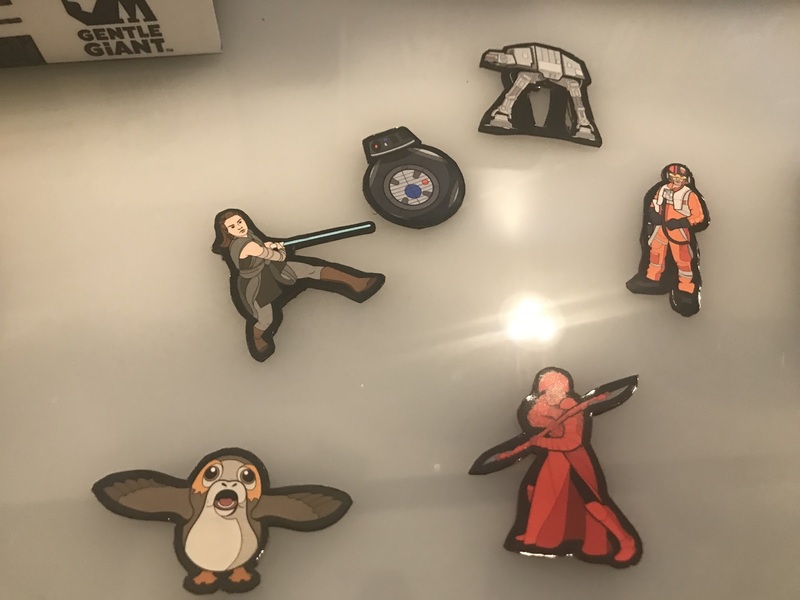 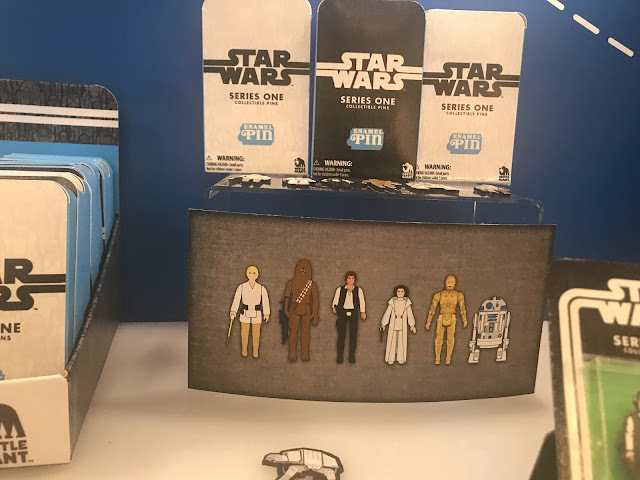 Further branching out, Gentle Giant gave their take on the enamel pin craze with a new line of Star Wars pins which will be available later this year. 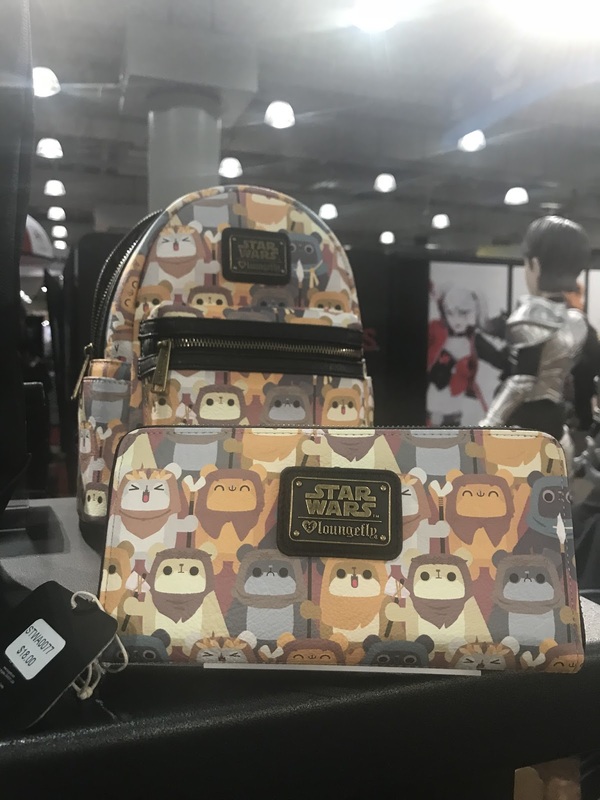 Funko introduced a new line of apparel and accessories with Star Wars motifs in a couture style. 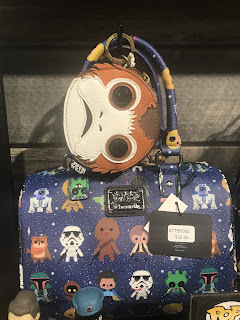 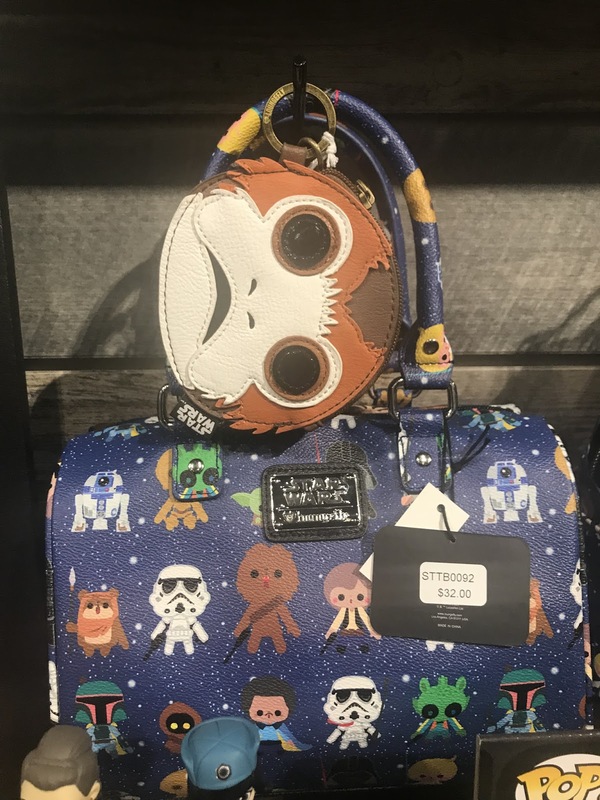 The line includes Porg wallets and Ewok handbags. 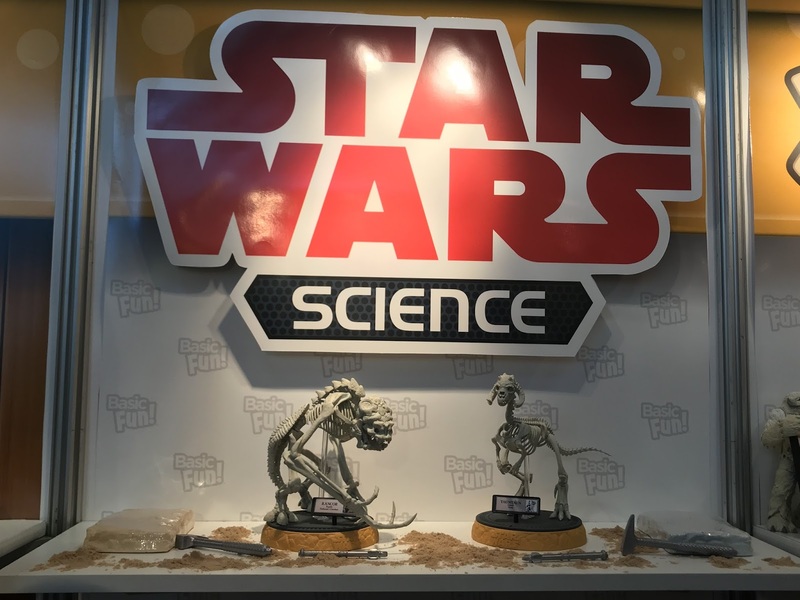 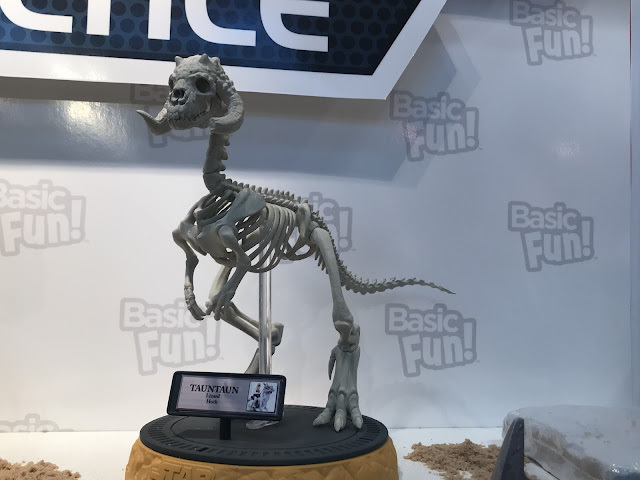 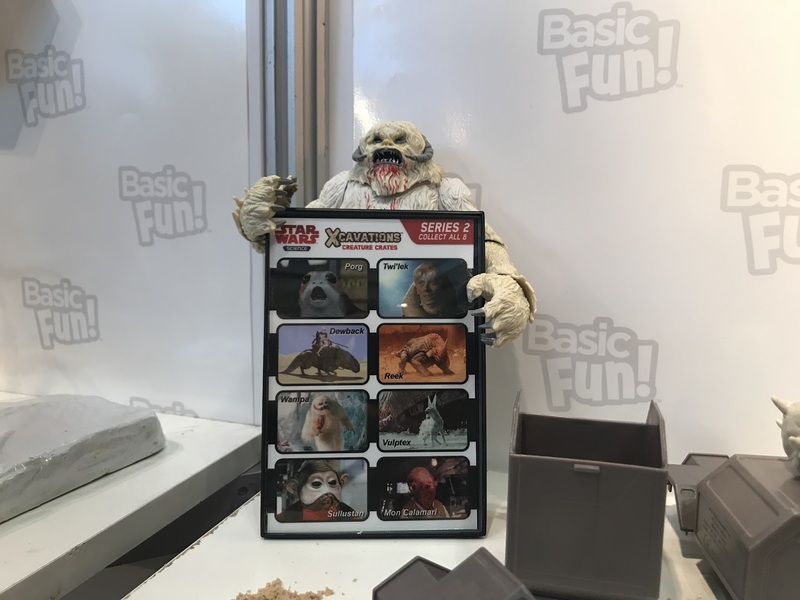 The education-based toy company Uncle Milton has combined paleontology and Star Wars into a fun and unique type of fantasy toy. 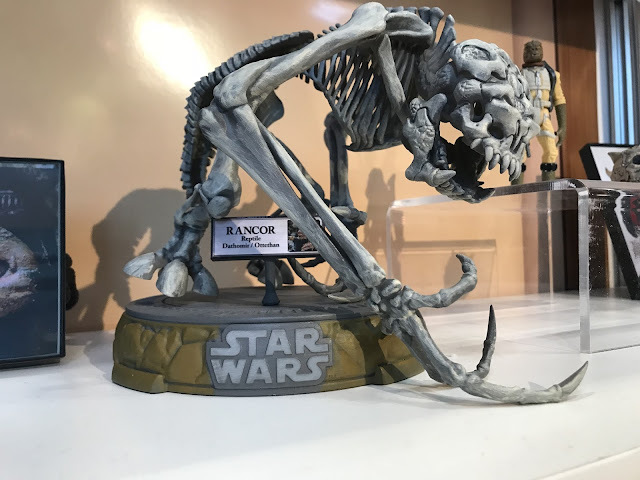 With approval of Lucasfilm, Uncle Milton has designed skeletal structures for the many different Star Wars creatures throughout the galaxy. 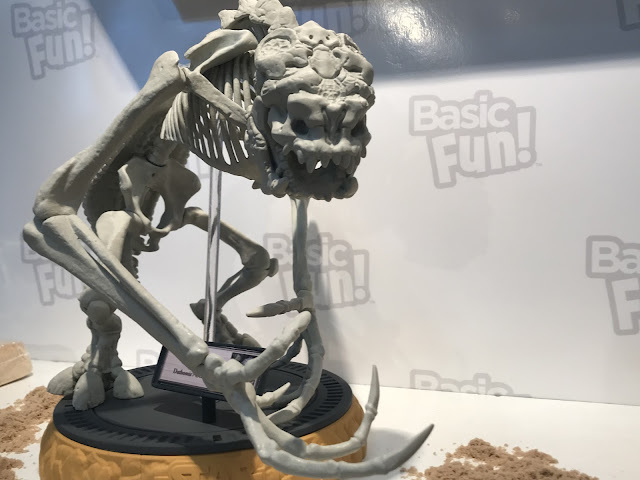 These skeletons are embedded into sandstone or a soft clay and are carefully excavated and assembled. 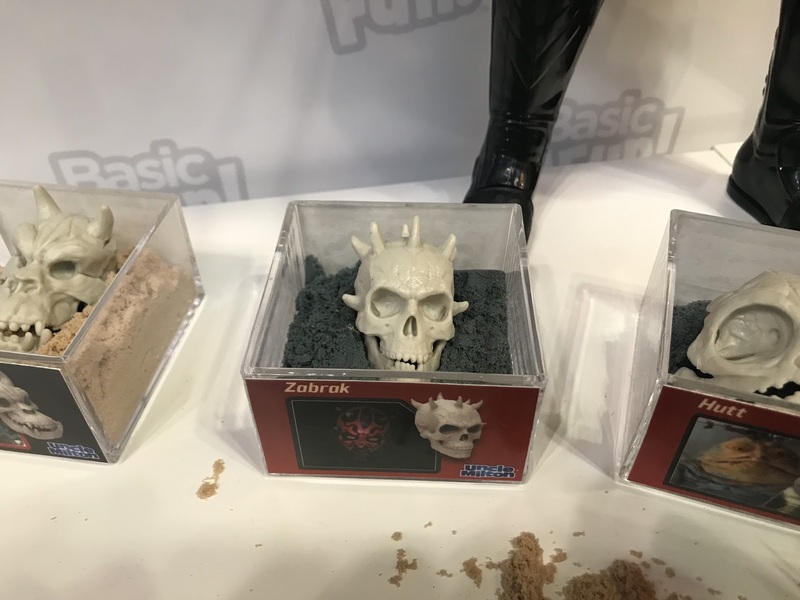 There is also a line of different skulls from many species of alien. 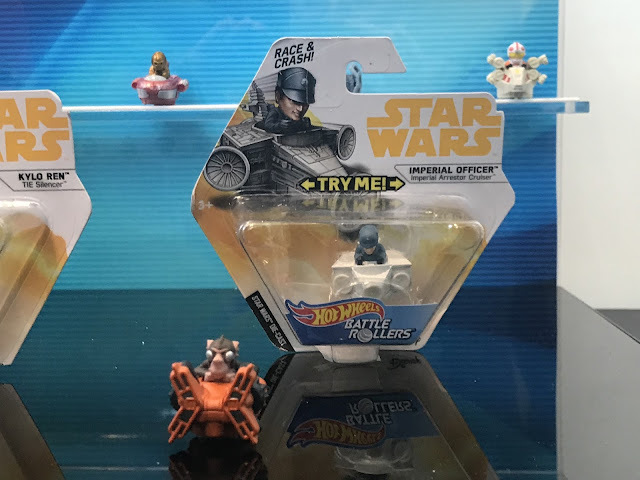 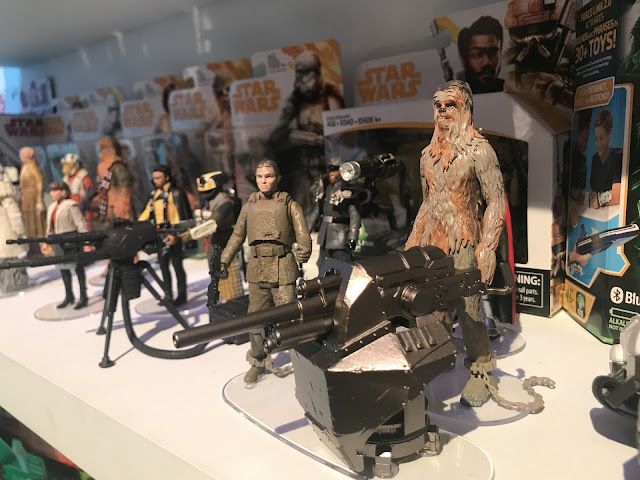 The next wave is scheduled to include a Porg. 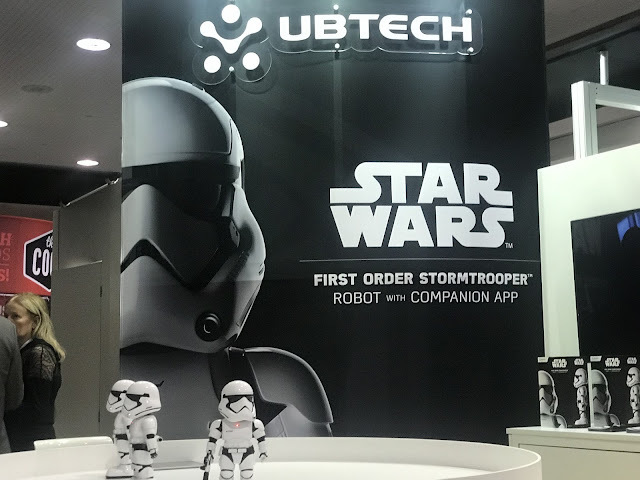 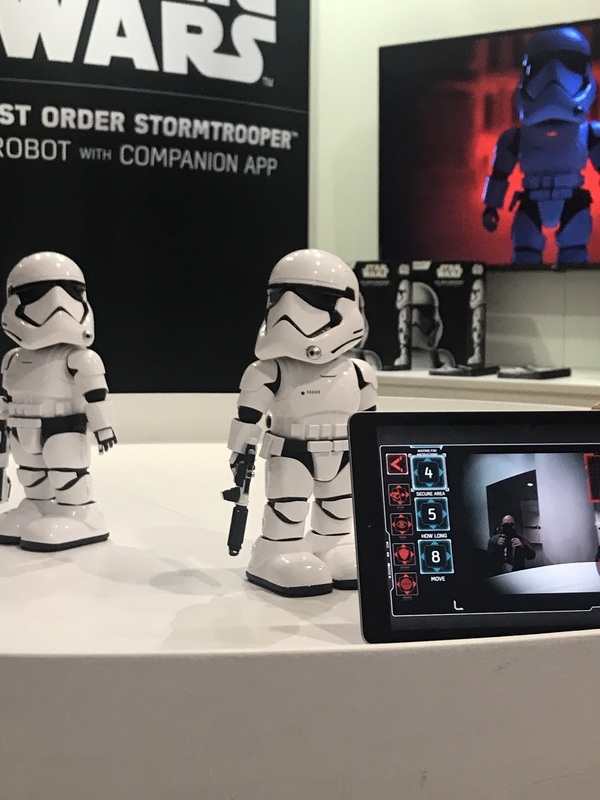 Ubtech, an artificial intelligence company has developed a mini humanoid Stormtrooper robot that is controlled remotely through an application and has ability to interact and learn. 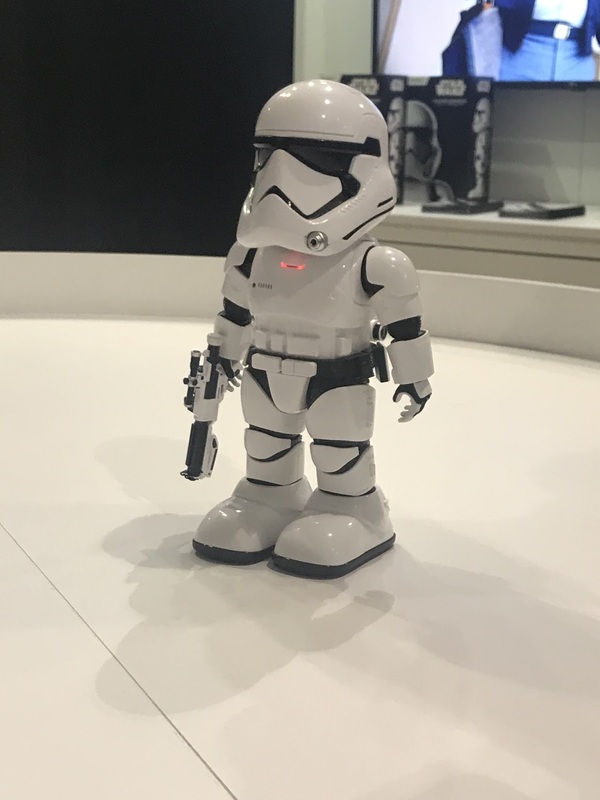 It’s design is reminiscent of the Japanese bootleg robots from the late 1970s which also had giant oversized Stormtrooper heads. 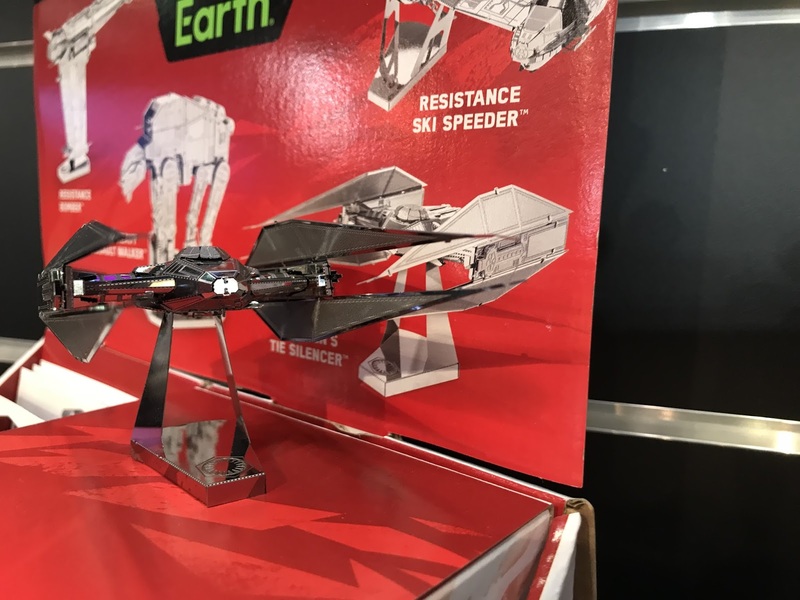 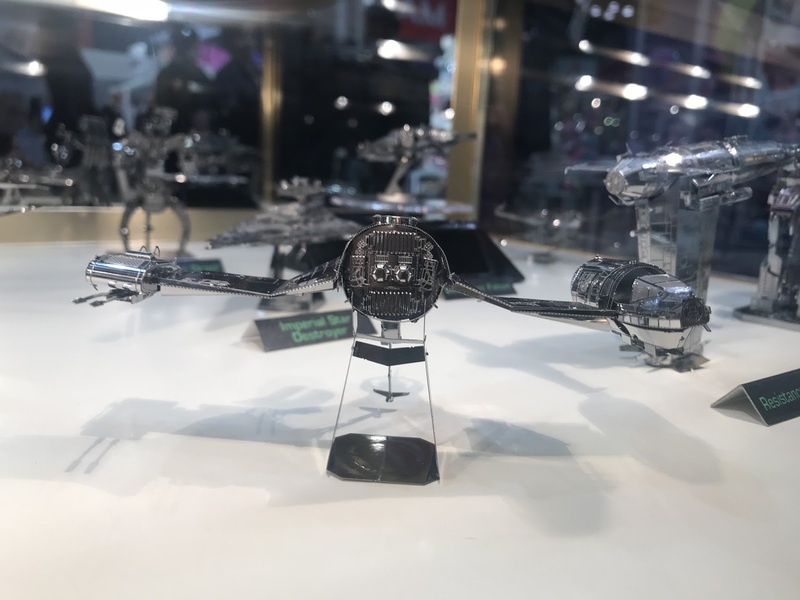 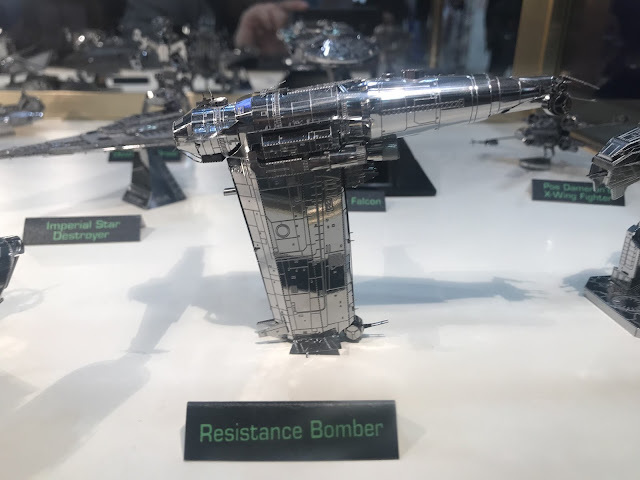 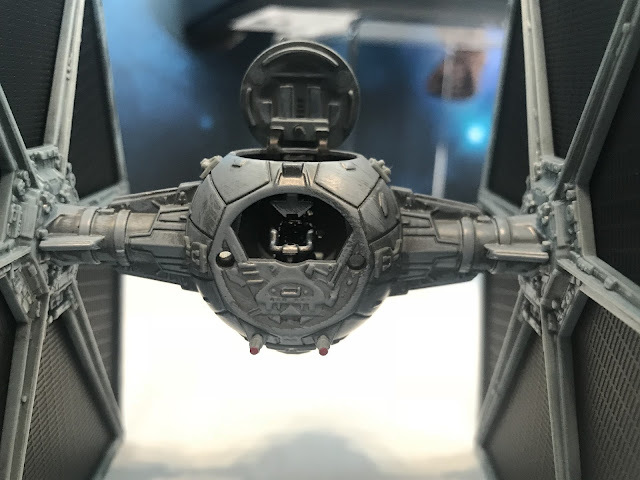 Finally, Metal Earth debuted four new model sets for The Last Jedi including a Resistance Bomber, a Resistance Ski Speeder, an AT-M6, and Kylo Ren’s TIE Silencer.